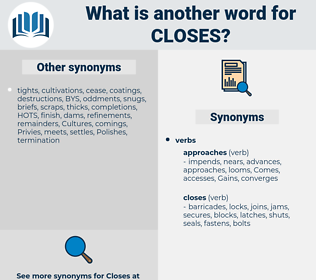 What is another word for closes? suspend, closure, closures, suspends, Reached, slams, halts, wound, farmers. seals, clasps, latch, latches, catches, lockouts, strikers, exits, fasteners, Holidays, logs, nuts, closures. 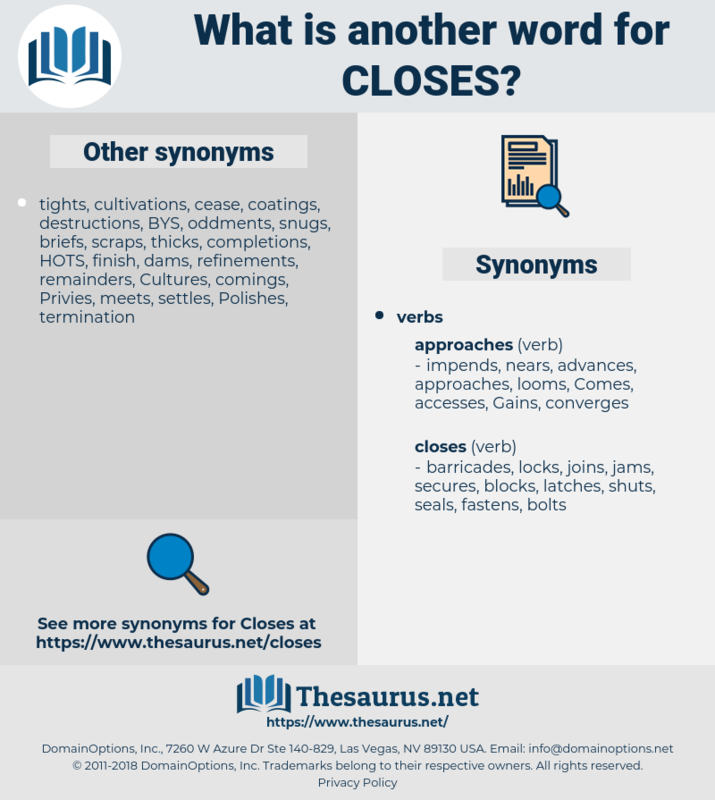 encloses, ceases, decreases, price, opposes, completes, classroom, reverses, encapsulates, poses, excludes, cessation, follows, classifies, categorizes, rise, rose, rises, supports, corresponds, eliminates, considers, stops, encompasses, disqualifies, finishes, class, Classes, coincides, Records, incorporates, terminates, climbs, contends, precludes, sets, pauses, approaches, Addresses, occurs, harbours, opens, prohibits, holds, culminates, uncovers, exit, surges, seals, involves, covers, enters, decides, contains, embodies, soars, reaches, forbids, outlaws, expires, rally, Rallies, relates, includes, offers, registers, shares, fills, lasts, exempts, presents, pays, adopts, falls, entails, drops, higher, links, ties, breaks, divides, hits, turns, determines, latches, fulfils, draws, wraps, jumps, bans, brings, implies, argues, fulfills, crashes, keeps, hardens, every, plugs, serves, quits, prevents, posts, up, exits, fits, Carries, meets, ranks, extends, logs, marks, Does, runs, dates, finds, slams. Of course, if one has a large correspondence and uses one's home as an office, it is better to have a large desk with a top which closes.